Annie was born on the island of Jersey and has lived in Sussex since 1986. Before that, as a member of the Findhorn Foundation, she was the founding teacher of the Moray Steiner School. She was involved in Steiner Waldorf education for over 25 years. 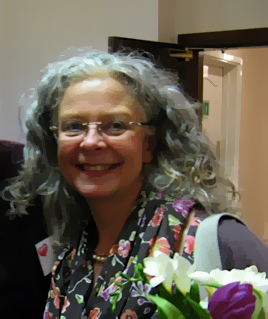 She has been a speaker or workshop leader at many international holistic education conferences. As a teacher trainer, at Emerson College, Sussex, she discovered her great interest in Interfaith, as she worked with students from over 30 nations. Often, all the major religions were represented among the student body, as they endeavoured together to find common ground and speak from the heart, in their exploration of spirituality, education and child development. 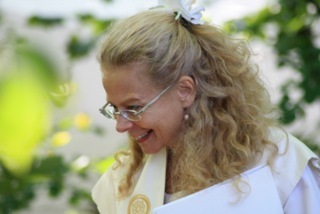 As an adviser and mentor in Steiner Waldorf schools in the UK and USA, (1996 – 2006) in many one to one supervision conversations with teachers, she found the path that has led to Spiritual Counselling as part of her ministry. In 1993 Annie performed her first wedding ceremony, for a Christian and Muslim couple, friends of hers, who wanted a spiritual blessing for their marriage. In 1997 she gave her first baby naming and blessing. 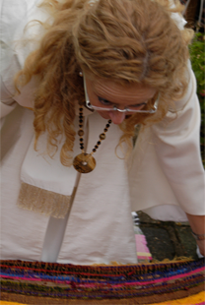 She has been creating and conducting spiritual ceremonies to help people mark times of celebration and transition ever since. Interfaith Foundation ~ "Many Ways, One Truth"
Annie Blampied was ordained by the Interfaith Seminary in 2004 after a two year training. She abides by their Code of Ethics and is listed on their public register. She is a member of the Registered Interfaith Ministers Association. 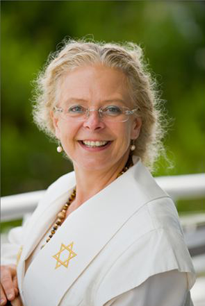 The Interfaith Seminary, founded by Miranda Macpherson, then known as Miranda Holden, is an innovative training programme for Interfaith Ministers and Spiritual Counsellors, to serve the spiritual needs of people from all faiths and none. “We train open-hearted men and women to become non-denominational ministers to support individuals, families and communities in living a direct, authentic spirituality that is relevant and helpful to our modern world”. The One Spirit Interfaith Foundation, is grounded in a universal and inclusive approach to spirituality. It believes that there is One God/Truth and many paths leading to the Source of All. It is not designed as a rival to traditional religions or their seminaries. Rather, it serves as an addition, promoting an ethic of respect, reconciliation, forgiveness and fellowship, supporting peace making and the remembrance of our human unity. "The two years training in London from 2002 to 2004 was one of the happiest and most challenging periods of my life. It certainly felt like “coming home” and studying the holy books, and practicing the central prayers of each of the major religions, month by month, was revelatory. The essence of what is true about our human nature and the great Spirit that created us became more clearly visible to me through this process. Rudolf Steiner said that whenever we take one step forward in our spiritual development, we need to take three steps forward in our moral development. This is how I experienced the training. Alongside studying the religions, we went through a deep spiritual psychological process to enable us to be free (as free as possible from emotional baggage) to practice as ministers. In the second year of the training, we went through the major cycles of human life, learning to create ceremonies to mark important life transitions, and at the same time, being trained in counselling to accompany people in times of need. One of the highlights of the training, for me personally, was being introduced to a book called A Course in Miracles. It was required reading on the course towards the end of the first year. After 25 years of conscious and assiduous spiritual questing and practicing, I experienced this book as extremely radical and different. I found in it a completely new way of seeing the world." The Interfaith Seminary training has developed and blossomed in many ways since Annie was a student. 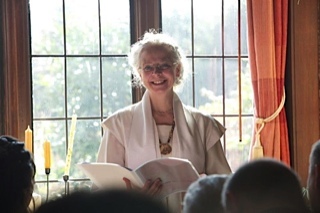 Being part of the Association of Interfaith Ministers, and being active in Sussex in support groups with other interfaith ministers, is an essential part of Annie’s life, keeping her grounded and nourished in her life as a minister.